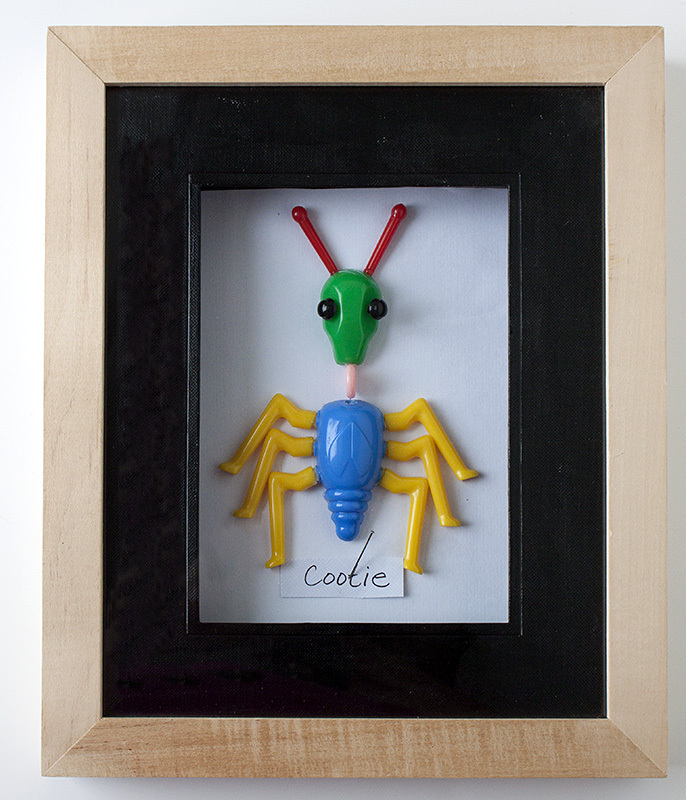 Framed cootie scientific specimen box to hang on your walls. I picked up a box of Cooties last year at a garage sale. I had a plan and it didn’t involve playing the game. I like the look of insect displays, but I don’t want to have a real insect display. I could have a Cootie display though. After inspecting the cootie, I felt that I should split the thorax and head. There is a seam that runs along the two pieces and if you carefully insert a flat screwdriver into it, it will pop apart with a little effort. I took the front pieces of the thorax and head and worked with them in the specimen box and chose the placement. I did have a bit of difficulty when it came time to attach the legs to the thorax, so I decided to hot glue the legs on to the thorax and glued it in place. I then hot glued the head, antenna and the tongue in place. 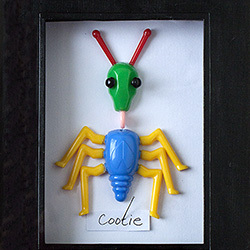 I then cut a scrap of paper and hand wrote “Cootie” to make it look like it was a real insect specimen and pinned it in place. This was such a fun project. I think I really like it because it is unexpected yet it is expected.